One of my greatest fears is that I will regain the weight that I have lost and more. It happened before to me. I had lost weight in the early 80’s and had gotten down to a size 4 from a size 16. And then, over time, my weight increased…dramatically. I talk about this in my blog post Getting to My Goal Weight – Twice! Well I finally graphed ALL my weights over time and the result is this graph…and it terrifies me. Most of my weight loss happened between 2013 and 2014 when I discovered that I was sensitive to grains and sugar. 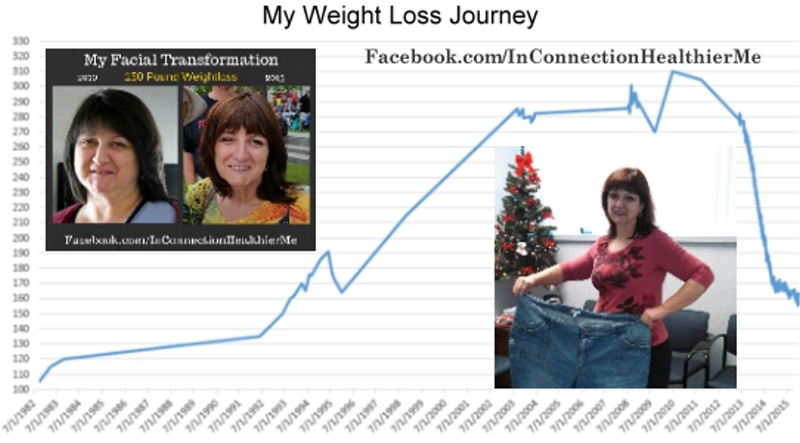 My Weight Loss Graph Spans Over 30 Years! I learned so much during that time period about the effect on grains and sugar and how it relates to my Insulin Resistance. I actually learned about and came to understand that I do have Insulin Resistance. Looking back I can see that I was in denial about that. Actually, it all seemed too complicated and I never really took the time to learn. I just took it for granted that because I didn’t have Diabetes that everything was good! How wrong I was! Because I have ALWAYS BEEN Insulin Resistant…and Insulin Resistance leads to Obesity. What?! I had always thought that because I was overweight I wasn’t exercising enough or was eating too much food! Well it turns out that I was trying to solve my weight loss by focusing on the wrong issues. I needed to correct the cause and not the symptoms. And the cause of my weight gain was my Insulin Resistance. Adding to that my thyroid issues and it is no wonder that I gained so much weight! My weight-loss has slowed down in the past year…so I am tackling the root cause…my Insulin Resistance. 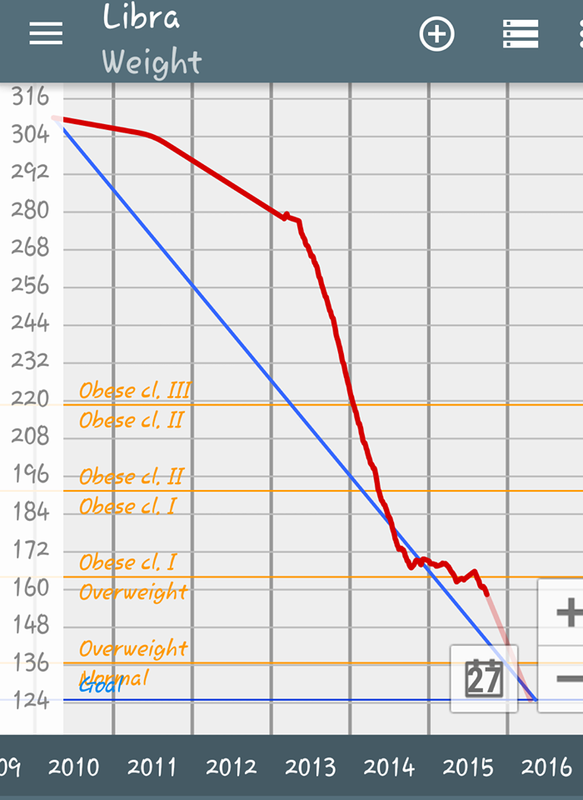 So, getting back to the graph you can see exactly when I went grain-free and sugar-free. The few times I lost weight before were my attempts at Weight Watchers…which didn’t work out so well for me. And you can also see that over the past year my weight-loss has slowed down…a lot! My fear? That my body is trying to adjust back to a higher weight or set-point. Well, as has been typical on this journey of mine I have learned that I am even more Insulin Resistant than what I thought. I have needed to decrease my carbs even more…to less than 25 grams a day. And this is actually working because the scale is finally moving down again! Posted on October 14, 2015, in New and tagged Insulin Resistance, Weight-loss Graph. Bookmark the permalink. 4 Comments. Over the time you’ve been grain and sugar free, did you ever give in and eat something not on plan, like candy or a dessert? If so, what effects did you see if any? Yes, that has happened to me Kathi…sometimes it was unintentional like when eating out at restaurants and getting exposed to ingredients. But other times it was intentional. I went through a phase where I would stop and get my 7-11 coffee with Almond Joy creamer. I swear my car would be on auto-pilot whenever I drove by one. I didn’t have noticeable side effects with that though but it sure was spiking my blood glucose! I am over that phase thankfully and it has been many months since I’ve had it. I haven’t had candy other than 85% dark chocolate on a rare occasion. And desserts I just don’t crave either. The side effects I see the most are with grains…belly swelling within 15 minutes and my normally quiet tummy start making all kinds of noise. Before going grain-free I never realized that your stomach was supposed to be quiet after eating. 🙂 I used to have bathroom bouts all the time so that comes back right away when I am exposed to grains. My skin rashes come back to a lesser degree and my joint pain comes back. Honestly, it feels like I have been hit by a Mack truck! So, mostly unintentionally but at times it is a choice….one that reminds me right away that it is not worth it. Your story is such an inspiration to me! I too am learning so much about my body! I am T2D and very insulin resistant! I’m also st a stall of 10 pounds! I’ve been at this since Feb 16. I’m now starting IF and it helps immensely with my Blood Sugars, but my weight is at a snail’s pace. Ive lost 14.5 inches, however my weight is so stubborn. Not cheated in that time! Gotten off dairy for a month…still no change. Have you experienced stalls and how did you deal with it? Thank you so much for sharing your story…you are an inspiration to me? Hi Linda, Thank you! I did stall a few times. I have to keep my carbs at 20g a day or less. So 80% fat, 15% protein and 5% carbs. I did discover that too much protein converts to glucose! So only eat enough protein for your requirements. Everyone is different. For me it is only 60-90g a day. The higher protein on days I lift heavy things. Hope that helps. I hope to start blogging again soon. Take care!